Orion Mini Candy Series - Let's be kids again! Tiny pellets of hard candy with a cylindrical shape and only 0.5 cm long, yet packed full of flavours to satisfy a candy craving. 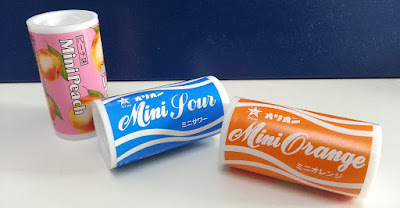 It’s the type of candy which is hard but seems to be made of compressed, powder-form ingredients so that when you bite on it, it breaks apart easily. With this, comes it’s packaging, a cylindrical plastic container with a resealable tab at the top. Come to think of it, it looks a bit like an old camera film container. Bonus points to those who know what this is, or even better, have used one of these before. Haha, just kidding. I was wondering why these were made so tiny. Even the candies were pellet-sized and obviously too small to be of any credit to our palate. After a little digging, I learned that these candies were targeted at children! Now it makes sense. The whole concept of down-sizing the size of the candies and putting it in a small, resealable and easy to carry container is just perfect for a kid’s pocket!